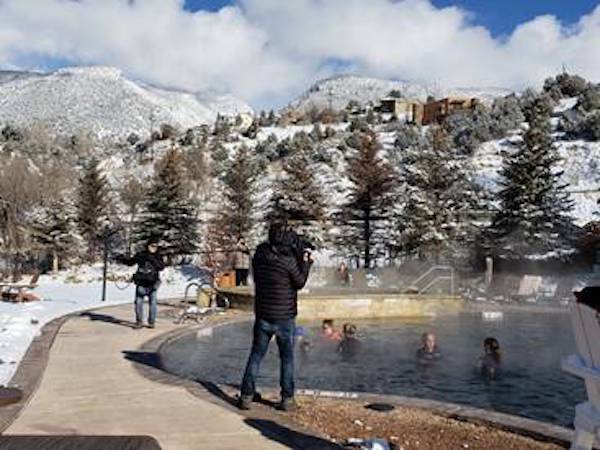 NBC's Today Show records a Neuroplastic Functional Institute session at the Iron Mountain Hot Springs, for a segment to air Friday morning. Earlier this month, a film crew for The Today Show shot footage of Glenwood Springs’ Neuroplastic Functional Institute (NFI) founder Lauryn Maloney-Gepfert and her staff helping three men with spinal cord injuries. Their story will air at 9 a.m. Friday on local NBC affiliates. The NFI, which has an office next to Glenwood Springs High School, serves as a multidisciplinary collective of health-care providers and professionals working with advanced brain-changing techniques to train people to heal independently. The institute combines neuroplasticity – the science of rewiring the brain for better health – in addition to the study of movement, performance, and function. However, much of the work Maloney-Gepfert does with her clients takes place at the Launch Pad in Carbondale and at the Iron Mountain Hot Springs in Glenwood. When Carbondale resident and local athlete Soren Lindholm was left paralyzed from the waist down from a spinal cord injury following a skiing accident in March 2017, he learned about Maloney-Gepfert and began working with her shortly thereafter. “Before I met Lauren, I had no movement in my legs,” Lindholm said in a news release. “We started out working in my home, then moved to Iron Mountain Hot Springs in December 2017. Lindholm’s success was centered on Maloney-Gepfert’s Neuroplastic Functional Training, which she has developed over the past 41 years. In addition to Lindholm, the Today Show segment will feature Maloney-Gepfert’s husband, Larry Gepfert, who she has also helped, as well as her team’s current clients. According to the news release, the airing of the story will further Maloney-Gepfert’s goal of encouraging other health professionals around the country to learn and use these techniques, and to help as many people as possible.